Many manufacturing companies hesitate to devote resources to the development of custom products. Air Science® thrives on rising to the challenge of any custom ductless fume hood or enclosure need. While standard ductless fume hoods, containment cabinets, and other air filtration systems serve an important need for the majority, customers with proprietary processes, niche industries, or those in search of a better method rely on our ingenuity and flexibility to design and develop high-quality custom products. Our culture of product innovation, coupled with a state-of-the-art manufacturing facility makes Air Science uniquely suited to design, prototype, and manufacture custom ductless enclosures to meet almost any customer challenge. Research, designing, engineering, testing, and production are completed in-house for all our products – both standard and custom. Manufacturing our products from scratch allows us to easily customize each and every product based on your needs. Our Multiplex™ Filtration Technology lends itself to an almost limitless number of filter configurations to meet virtually any application. The Multiplex system combines one or more filtration options, including an electrostatic pre-filter, an activated carbon main filter, and an optional HEPA/ULPA safety filter for the capture of acids, bases, and particulates. Based on your application needs, we can design systems with the unique airflow needed to protect your personnel or your work. 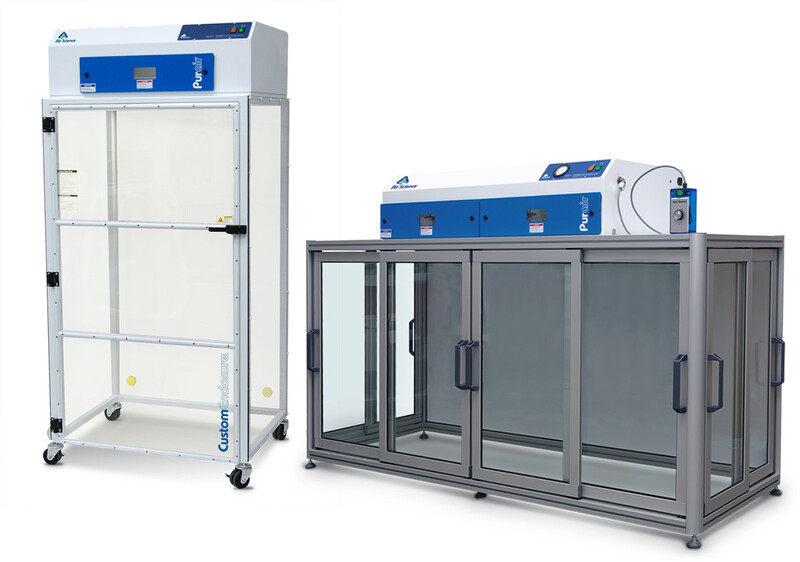 Our standard systems include both vertical and horizontal laminar flow hoods as well as other airflow patterns. Our enclosures can be manufactured in any size, large or small, using a wide array of materials. Our manufacturing processes allow us to easily adapt product designs to fit your existing facility spaces without the need for costly ductwork construction. Contact us for a consultation. We can adapt an existing standard product or design something entirely new to solve your specific concerns. Our consultative services meet you wherever you are in the process. Whether you have a problem and do not know where to start or already have a solution in mind, a rough sketch, or an engineering drawing, we can lead you through the next steps. Our extensive portfolio of custom ductless filtration systems demonstrates our ability to design custom solutions to meet your specific application, documentation, and regulatory or standards and compliance requirements while managing project costs and providing accurate and efficient estimates.